Hills, forest, picnic spots and playgrounds, all close to the river. Type: Varied. There are some natural environment areas as well as picnic and playground areas. Location: 5050 Spruce Dr. S.W. 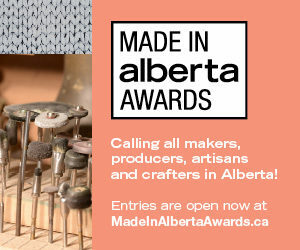 You can also access the park by following the Bow River Pathway across the bridge located near Angel’s at 4105 Montgomery View N.W. Things to do: Walking, hiking, running, biking, picnicking, nature exploration, special events. 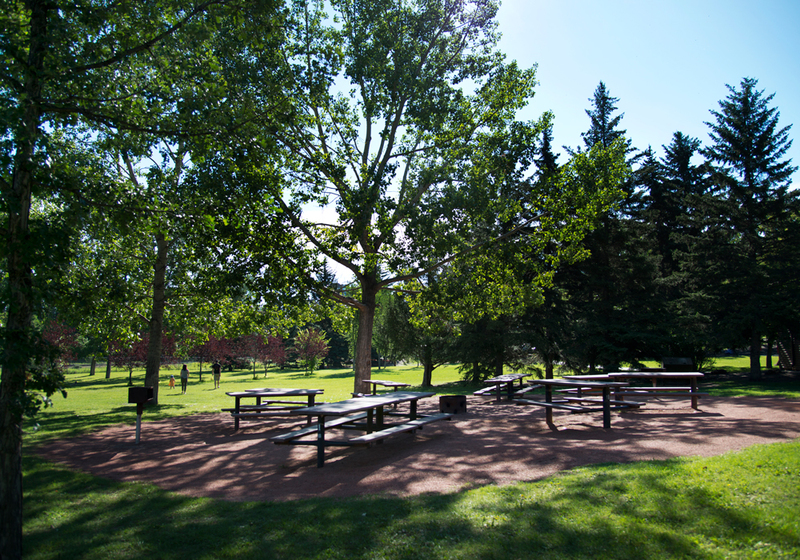 Everything about Edworthy Park is big – big hills, big trees, big picnic areas, big playgrounds. The big hills attract a lot of people who enjoy getting their workout outdoors, while the big picnic areas attract big family and community gatherings. The park has a very wide variety of landscapes and amenities, so there’s something for just about everyone here. Access to the park at the Spruce Drive entrance is via a long winding hill. 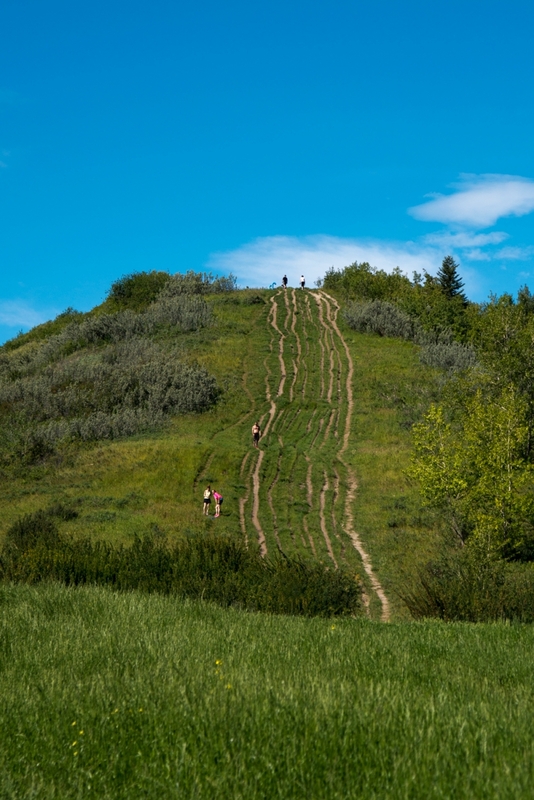 It’s a popular spot for runners and cyclists eager to add some serious incline to their workout. If you bear left rather than right at the park gate, the road leads to the Edworthy Park off-leash area, where happy herds of dogs have lots of room to run. Edworthy has all sorts of bookable picnic sites that can accommodate anywhere from 25 to 100 people. Some have firepits, some have shelters. Most are within sight of a playground, and within walking distance of washrooms, so they make very family-friendly places to throw a party. 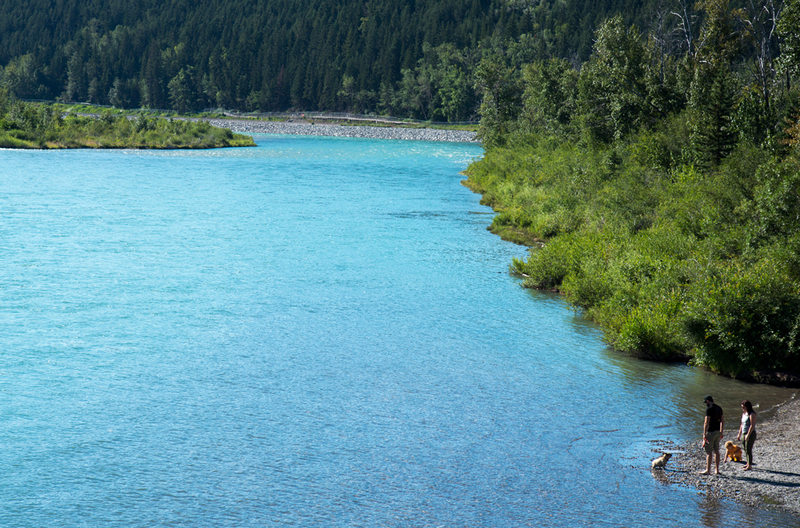 The Bow River runs all the way along the eastern edge of the park, and there are lots of spots where you can pop down to the river to dip your toes, or watch rafters drifting by on hot days. 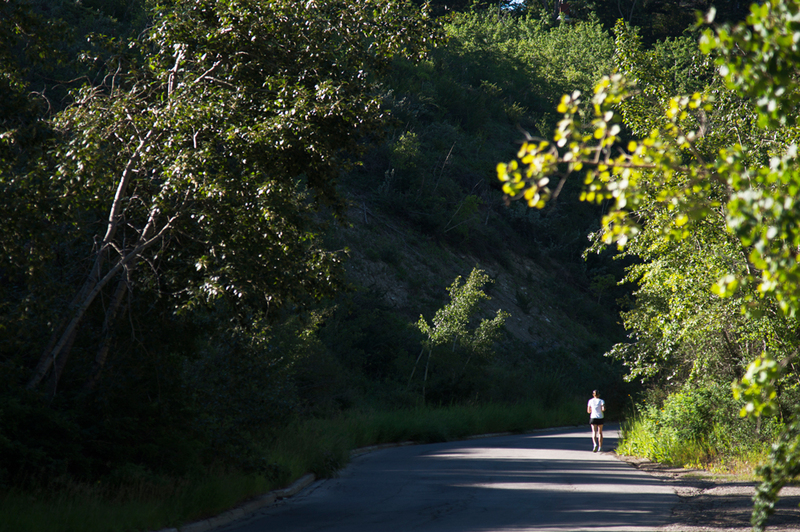 The Bow River Pathway runs parallel to the river, and stays flat and level for a relaxed walk or bike the length of the park (about 3.5 km, 1.5 hours return), but for those who are definitely not here to relax, there are lots of well-worn paths on the steep hills that you can put to good use. 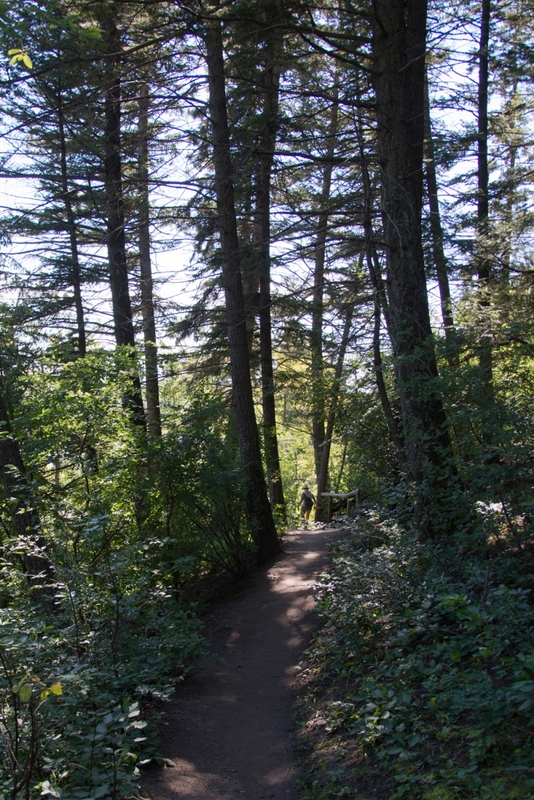 The Douglas Fir Trail is a 2.5 km long hike in Edworthy Park that takes you through a beautiful Douglas Fir forest. These trees are common on the temperate and rainy west coast, but the steep hill that is one of the park’s main features shelters this rare stand of forest, one of the farthest east in Canada. The forest is dense with lots of leafy undergrowth. The terrain is rough, with very steep sections, so wear sturdy shoes. 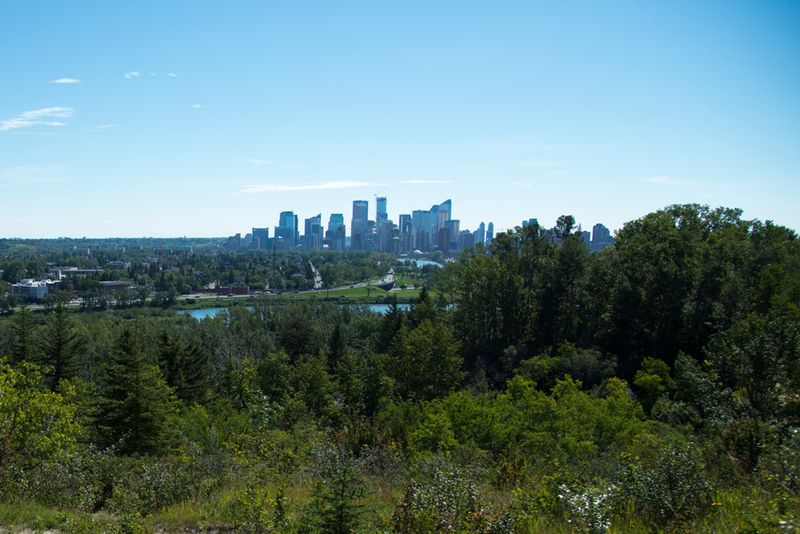 To get to the trail from the Spruce Drive entrance, park in the lot at the base of the hill, then follow the Bow River Pathway south – the trailhead is on the right. There are even bike racks if you’d like to cycle to the trailhead. The payoff for all of that hill climbing, of course, is the view. The Douglas Fir trail has a number of nice lookout spots with benches so you can catch your breath and relax for a bit before making your descent.